With the right outdoor lighting and related options, you can turn a boring yard into somewhere you and your family will love spending time. Before you start adding lighting to your property, have a plan for where you want the lighting to go. We’ll help you create outdoor spaces you will enjoy day and night. 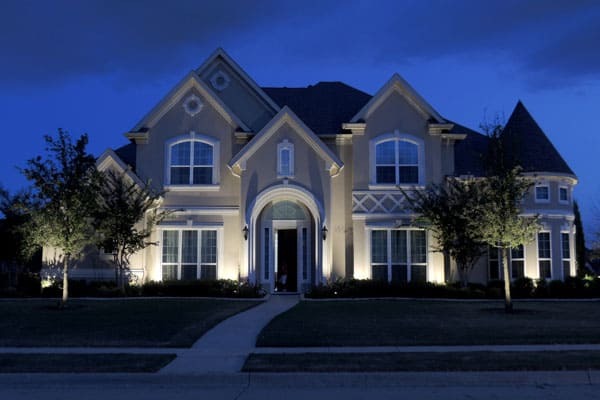 The type of low voltage lighting you use and the specific fixtures you have in your yard should generally be secondary to the desired effect of the landscape lighting. Even with that in mind, though, you want to use the right fixtures so you get a balance of beauty and durability. By choosing LED lighting, you can save money on your electric bill, and your lights will stay cool. That means less maintenance and a beautifully lighted yard you can enjoy anytime. We can help make your yard the perfect place to relax as well as entertain. 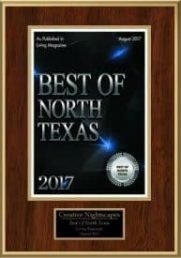 As a big part of the Dallas-Ft. Worth metroplex, Southlake is a great Texas community that more than 26,000 people call home. The Southlake Town Square is a popular gathering place, where people can enjoy each other’s company, appreciate nature, and have plenty of shopping and restaurant options. While many communities have moved away from the town square idea, Southlake has used it to bring people together and keep them coming back to get involved with the town and with one another. The city is also well known for Gateway Church and for its great public schools. Incorporated in 1956, Southlake is located along the shores of Grapevine Lake, which was finished in 1952. Being so close to the airport was a real boon for Southlake, and it has been growing rapidly as more people want to live and work near DFW. People have recently started to move out to the edge of Southlake, expanding the community because so many people want to be in the area and the city boundaries are nearing capacity. Because Southlake is so popular with younger and older people alike, there are always people moving in and wanting to make their new home and yard beautiful. Many residents have recently started to move out to the edge of Southlake, expanding the community because so many people want to be in the area and the city boundaries are nearing capacity. Creative Nightscapes consulted, designed and installed beautifully and professionally within the space of a few short weeks. We love the way our house looks now both in front and in back. Would highly recommend their services! Jerry provided a great lighting plan and excellent service during installation including coming back to the house after dark to make sure all was perfect. Great service and beautiful lighting! Being a businessowner, I truly appreciate great service. Creative not only had great service but the lighting looks fantastic! Thank you! From start to finish the Creative Nightscapes Team was wonderful. I got a bid within 2 days of my original call, and 5 days later I had all my lights fully installed in just one day at a fabulous price and they are beautiful! My highest recommendation goes to these folks. Courteous, great prices, on time, good, fast & clean work, the process was complete in 1 day. I'm thrilled! Lighting plan was excellent and very well executed. The crew was fast and very neat. Jerry Holbrook was a pleasure to deal with and was most helpful through out the process. I would use them again and also highly recommend. Creative NightScapes was very professional, We love the results and I would definitely use them again. Jerry and team have been great. I look forward to extended the lighting at my home. Love our new lighting both in front and back yard. We can't say enough about the awesome service from sales to installation to clean up! Installing new kichler lighting system on home in Southlake. Facade up lighting, moonlighting and pool area landscape lighting. Installed kichler lighting system on home in Southlake. Facade up lighting. Backyard pool and putting green lighting. Installed Kichler LED outdoor lighting at home in Shady Oaks. Place up lights to accent facade of home, peaks, front entry way, and tree canopies. Removed high voltage lights from back yard and installed Kichler low-voltage, LED, outdoor lighting at home in Chesapeake Place. Placed up lights to accent Magnolia tree, Yaupon Holly trees behind the pool, Oak trees, and trees along the fence line. Removed existing high voltage lights from front of home. Installed new Kichler, low-voltage, LED, outdoor landscape lights at home in Monticello Estates. Placed up lights to accent facade of home, Crepe Myrtles, Holly tree, canopies of Oak trees, Maple trees, Pine trees, and bushes. Mounted down lights in various Oak trees in the back yard to highlight the yard below and the walkway along the side of home. Set button top pathway lights to highlight front walkway, steps from driveway to pool area, pool deck, walkway along back side of home, and landscape beds along fence line. Installed Kichler LED landscape lighting at home in Lonesome Dove Estates. Placed up lights to accent the front facade of home, columns, statue, Crepe Myrtle, Live Oak trees, and a Maple tree. Installed Kichler LED lighting at home in Monticello. Placed up lights to accent facade of home, entry way columns, Oak trees, and Crepe Myrtles. Mounted down lights in Oak trees to highlight driveway below. Set path lights to illuminate the walkway to the front entry. Upgraded existing lights and installed new Kichler LED landscape lighting at home in Wingate Hill. Placed up lights to accent facade of home, columns near gate, ornamental grass, Palm tree, Maple tree, Vitex trees, Crepe Myrtles, Oak trees, and Japanese Ewe trees. Down lights mounted to highlight gated entry, driveway, side gate, and yard in front and back. Path lights set to illuminate walkway and bridge in front of home. Upgraded existing lights to LED and installed new Kichler outdoor lighting fixtures at home Westwyck Hills. Placed up lights to accent canopies of various trees and second chimney. Mounted down lights to highlight yard, parking area, driveway, courtyard, landscape bed in front of pool. Mounted hardscape lights under pergola to highlight fire pit area. Removed existitng builder lights. Installed Kichler LED landscape lighting at home in Johnson Place Estates. Placed up lights to accent facade of home, columns, address sign, and canopy of Cypress trees. Mounted down lights under eaves to highlight play set in back yard and parking area. Remove existing fixtures and install Kichler LED outdoor landscape lighting at home in Carillon. Placed up lights to accent facade of home, front entry, dormer, trees, and fountain. Mounted down lights and hardscape lights to illuminate garage doors, walkway, patio, and pool deck. Upgraded existing halogen bulbs to LED and installed new Kichler LED outdoor fixtures at home in Shady Oaks. Placed up lights to accent columns, facade and peaks of home, Crepe Myrtle, and small trees behind waterfalls. Mounted down lights in eaves to illuminate driveway area, fountains, walkway, and waterfalls. Set wash lights to accent planters and landscape greenery. Installed Kichler LED outdoor lighting at home in South Ridge Lakes. Placed up lights to accent facade of home, columns, Holly trees, Crepe Myrtles, Stevens Holly trees, and tree canopies. Set path lights to highlight walkway and landscape in back yard. Mounted down lights and hardscapes under eaves to illuminate grilling area, steps off back patio, and facade of second level walkout above grand entry. Installed Kichler LED landscape lighting at home in Timarron. Set path lights to highlight the walkway leading to the front entry from the driveway. Placed up lights to accent Crepe Myrtles along walkway and the canopies of the trees. Installed Kichler LED lighting at home in Southlake. Placed up lights to accent columns, Oak tree canopies, Vitex trees, Yaupon Holly trees, and Sprite statue. Mounted down lights in Oak trees along driveway to highlight driveway and yard area below. Upgraded existing lighting to LED and installed new Kichler LED lighting at home in Worthing. In the front: Mounted down light in eaves to illuminate driveway area. Mounted hardscape lights above garage to accent garage doors and illuminate walkway. In the back: Placed up lights to accent trees. Mounted down lights to create a moonlight effect, illuminate walkways, steps, waterfall, diving rock, and yard. Installed Kichler LED outdoor lighting at home in Monticello. Placed up lights to accent facade of home, columns, front entry, Oak tree canopies, Palm trees, and Crepe Myrtles. Mounted down lights in eaves to illuminate yard, seating area, pool deck walkway, area behind BBQ grill, and garage driveway area. Set path lights to highlight front walkway, steps and landscape greenery. Installed Kichler LED lighting in back yard at home in Stone Lakes. Placed up lights to accent Holly trees, planters, and dog house. Set path lights to highlight landscape beds and garden area. Mounted down light under eave to illuminate pool deck. Installed Kichler LED outdoor lighting at home in Chesapeake Place. Placed up lights to accent the facade of home, columns, Crepe Myrtles, Red Plum tree, White Oak tree, Yaupon Holly tree, Magnolia tree, and tree canopies along back fence line. Mounted down lights under eaves to highlight lounge area and pool deck. Set path lights to illuminate the garden and pool deck. Installed Kichler LED lighting at home in Princeton Park. Placed up lights in front and back yards to accent Large Oak trees, various Evergreen trees, Crepe Myrtles, and the putting green. Installed Kichler LED lighting at home in Carroll Meadows. Placed up lights across front home home to accent facade. Installed Kichler LED landscape lighting at home in Timber Lake. Placed up lights to accent front entry, facade, peaks of home, and canopies of various trees. Mounted down lights in eaves and trees to create moonlighting and illuminate driveway, yard, swing, lacrosse net, and trampoline area.